Your Pet’s Count - Help them to the Best Life 4 Pets! Simply put, your pet’s health should be an extension of your own- after all, you are their guardian, their caretaker, their parent- and they depend upon you for their health and well-being. 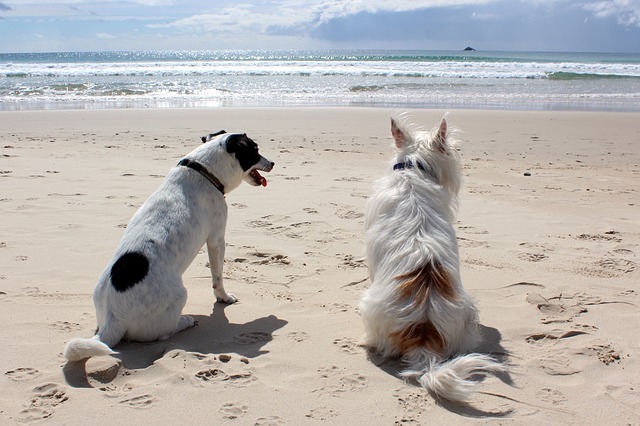 As the parent of a pet or even several pets you will undertake many things to keep your best friend healthy and happy. You feed them the best food you can, ensure they are active, play with them and provide mental stimulation and naturally you care for them emotionally with lots of love and hugs! However, even with your best efforts, pets will fall ill, get injured, or need extra support as they age to maintain their inner health and mobility. When they are not feeling well, or just need an extra boost- as we all do at times, you want to know that you are giving them something wholesome and natural that is good for them and, of course, won’t cause them harm. Petsability is a family owned business, launched with your pet’s health at the forefront of all they do. They offer a number of natural remedies, under the BestLife4Pets brand, to help your beloved pets feel their best on the outside, as well as the inside. Here’s more helpful information on BestLife4Pets! Petsability and the BestLife4Pets brand was started by Viktoria Harris; out of a need to find effective natural remedies and supplements for pets that would not be detrimental or filled with artificial ingredients. Viktoria’s interest in alternative medicine first started when her daughter was born with a condition called TEF that caused her to undergo numerous surgeries at a very young age. Hating the side-effects caused by traditional medications, Viktoria turned to homeopathic and other natural remedies for her daughter and the rest of her family with fantastic results. Having experienced the amazing benefits of these natural remedies and treatments on her family, Viktoria started looking for similar treatments for her dog when he got sick. Not finding anything readily available, Viktoria searched out the best homeopathic remedies and adapted them for pets! “Dogs and cats can’t always tell us what is wrong with them, so I needed to find remedies that would work on a number of different possible issues and symptoms to help alleviate pain and stress and restore balance to a compromised system. I hate seeing animals in pain, so once I found a quality product that I could trust my own family to, I decided that I could help not just my pet but also other dogs and cats the same way. And that is how BestLife4Pets came about. We aim to help as many dogs and cats as possible get pain relief and feel better the natural way” said Viktoria. 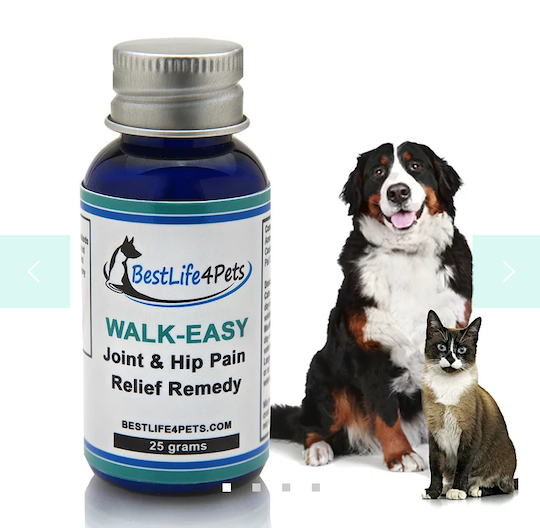 One of the most popular products to help your pet feel better physically is WALK-EASY- a Hip & Joint Pain Relief Remedy. This homeopathic remedy is made from select plants used for centuries to reduce inflammation, ease joint stiffness, and relieve the chronic pain and burning of arthritis. Just as with people, joint pain and inflammation are very common amongst pets, especially as they age. Some pets may experience developmental problems early on in life, such as hip or elbow dysplasia, where the joint does not develop properly from birth. But many others will develop age-related joint issues such as degenerative joint disease and arthritis. Eating healthy and exercise is very important for maintaining the health of your pet, but when they start showing difficulty in getting up, trouble climbing stairs, jumping, or falling on slippery floors, this is where WALK-EASY can help! Unlike other anti-inflammatory supplements, which treat the symptoms but not the underlying cause, or Nonsteroidal anti-inflammatory drugs (NSAIDs) that come with side-effects such as stomach ulcers, or possible liver and kidney failure, this specially formulated homeopathic medicine has been proven to enhance your dog or cat’s mobility and provide long-lasting joint pain relief naturally…and without any harmful side effects. Katherine B. - This has helped my dog with his leg pains, and I have since ordered more for him. I have tried other homeopathic and prescription type of medications, but this has really helped. There are so many different ones to try and I have tried a number of them, but they have not worked as well as this one has. Ms. Naughton - My Akita is 115lbs and has arthritis in his leg. I used this product as an alternative to carprophen (prescription for dogs) and works slower but work well. I prefer natural healing to prevent any damage to the organs. One important area that affects our overall health and how we feel is located on the inside - and that is in our gut or more accurately our gastrointestinal tract. Maintaining a healthy gut has been shown to help prevent disease, improve digestion, aid in the absorption of nutrients from foods, strengthen the immune system, and so much more. It comes as little surprise that just like with people, your pet’s immune system is closely linked to the digestive system in his/her gut, which contains approximately 70% of all immune cells. In other words, your pet’s gut and the health of his digestive system are vital to keeping your four-legged companion healthy and happy! People have been using probiotics for years, but it is only recently that they have started using them for their pets. Many holistic veterinarians have been recommending probiotics for years, but with recent studies, even medical vets have begun to agree that probiotics are beneficial to keeping your pet’s gut healthy, thereby reducing their chance of developing digestive and immune system related health issues. More on probiotics and why your pets need them! 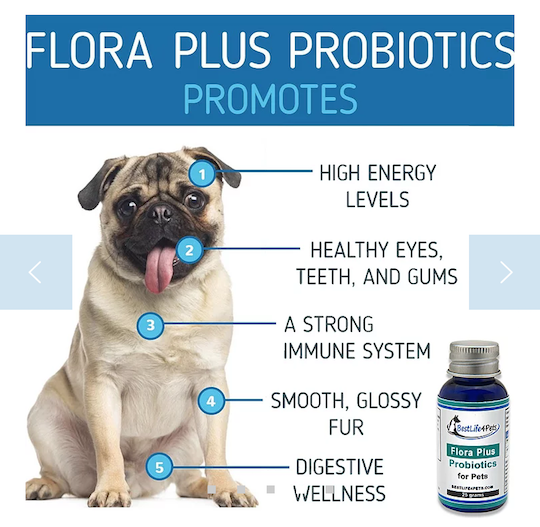 Probiotics are the “good” or “helpful” bacteria that live in your pets’ intestines and are responsible for nutrient absorption, digestive health, and immune system support. Certain species of bacteria that thrive in dogs are Lactobacillus, Bifidobacterium, Streptococcus, and Enterococcus. Without the right amount and balance of “good” gut bacteria, your pet can experience major health issues such as severe stomach pains, bloating and gas, chronic diarrhea, and even inflammatory bowel disease. The benefits of probiotics are not just for sick pets. Taken on a daily basis, probiotics keep optimal levels of helpful bacteria in the gut, thereby helping with food absorption, boosting the immune system, increasing metabolism and energy levels, helping the body to maintain an ideal weight, and reducing digestive related illnesses and problems such as gas and bad breath. Certain foods such as Kefir or Yogurt, some fermented vegetables, and seeds contain natural probiotics, but when your pet is not getting enough, a Probiotic Supplement is recommended. BestLife4Pets FLORA PLUS is a probiotic specially formulated for your pet. This high quality MADE IN USA probiotic is derived from 5 select friendly live bacteria strains native to your pet’s system making it super effective in boosting their immunity and strengthening the GI tract. As well as helping pets with food sensitivities, stomach issues, gas, and vomiting. FLORA PLUS also helps to reduce allergies, skin irritation, itching, and excessive shedding. Best of all, you can take it with you wherever you go as it doesn’t need to be refrigerated. This high quality probiotic is stabilized and stored in dry pellets, but when it comes in contact with your pet’s gastrointestinal tract, the bacteria become live, active, and multiply many times over ensuring your pet gets the best probiotic made especially for them. BestLife4Pets- because your pets deserve the best! BestLife4Pets ultimate goal is to offer high-quality natural products that improve the lives of your pets- every day. Built upon the foundation that just as more people today are striving to use natural products and put “GOOD FOR YOU” ingredients into their own bodies to stay healthy, we owe it to our pets to do the same. That is why BestLife4Pets remedies are all-natural and contain no harmful ingredients or additives. You can find BestLife4Pets WALK-EASY, Flora Plus Probiotics and other natural medicines and supplements Here! * In partnership with our friends at BestLife4Pets.